Why is it spelled like that? I always thought it was lasagna, no? Well, my co-worker/cube mate was telling me that she made a lasagna for family that was visiting over the holidays. That, coupled with the Bestest bringing over a delicious homemade lasagna a couple weeks back, I was on a mission to try to make one. The Lil makes one frequently, which was also a little inspiration. Since my co-worker and I chat all day, Monday through Friday, we talk about a lot of stuff – family, kids, cars, work, life, anything really. We sit about 15 feet apart from one another. Since she just made her’s and said it was good, I asked for the recipe. She gladly scanned it at home and brought it in. She couldn’t remember which cookbook it came from, but I found a very similar recipe from Betty Crocker, Italian Sausage Lasagna. I wanted to make it during the week, but since she mentioned I should let the sauce sit for a few hours, it didn’t seem feasible to make on a weeknight. So, I waited for a Saturday AM to making everything. After Midtown, I headed straight home get started on the sauce AND coffee, always coffee! At its best served with bread sticks and a tossed salad of greens with black olives and zucchini slices. ; follow with supmoni ice cream. Cook and stir Italian sausage, onion and garlic in 10-inch skillet until sausage is light brown; drain. add tomatoes (with liquid), tomato sauce, 2 tablespoons parsley, the sugar, basil, and 1/2 teaspoon salt. Heat to boiling, stirring occasionally; reduce heat. Simmer uncovered until mixture is consistency of thick spaghetti sauce, about 1 hour. Cook noodles as direct on page 221. Reserve 1/2 cup of the sauce mixture. Mix ricotta cheese, 1/4 cup Parmesan cheese, 1 tablespoon parsley, 1 1/2 teaspoons salt and the oregano. Layer 1/3 each of the noodles, remaining sauce mixture, mozzarella cheese and ricotta cheese mixture in ungreased oblong pan, 13x9x2 inches. Repeat 2 times. Spoon reserved sauce mixture onto top; sprinkle with 1/4 cup Parmesan cheese. Cook uncovered in 350 degree oven 45 minutes. let stand 15 minutes before cutting in to 8 to 10 servings. 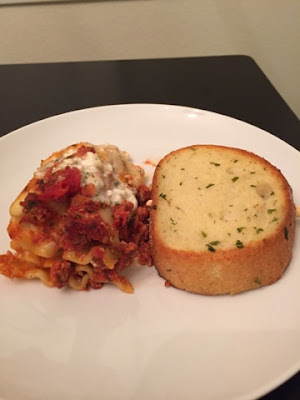 Do-Ahead tip: After cooking, lasgne can be covered and frozen no longer than 3 weeks. To serve, cook uncovered in 375 degrees oven until bubbly, about 1 hour. My co-worker suggested I cook the meat and sauce as listed, but then let is sit for a few hours, three to be exact. Per the directions, L and I made the sauce. Then we made the cheese mixture, so we could be ready to roll when the simmering was done. She played and I watched nonsense TV while we let it simmer. Finally, it was time to put the masterpiece together. I sprayed non-stick spray, even though it wasn’t suggested. Noodles. Sauce. Cheese mixture. Repeat two times. Add Parmesan. Bake. I can do this again. I want to do this again. We decided we needed the delicious “garlic knots” from Target so we headed there before we baked our goodness. Unfortunately they didn’t have the knots, so we got the next best thing…Garlic Texas Toast! Back home, we baked the lasagna for 45 mins as directed. Dinner time! We didn’t even wait for the repair guy to leave, so rude, huh?! 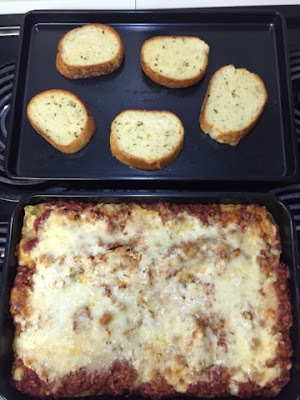 The scent of lasagna is an amazing aroma! Guess what? Everyone liked it!! As the days went on, the leftovers tasted even better. The Guidette and the Teacher stopped by one night and I fed them some and they really liked it too, enough to even take some for lunch the next day! I count that as a win for me, the non-cook! Although a little tedious, I am happy I made it AND even happier it came out so tasty! Now I can make it again and I know the process will go faster the second time around. All you can do is try! My mom recently bought that Texas toast. It was pretty good.